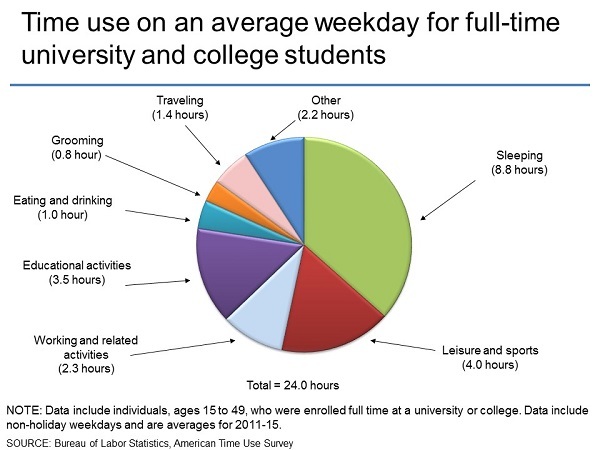 How Do College Students Spend Their Time? Find a Top Rated College Tutor Near You! It's simple and secure - Get real results fast. Find expert private tutors at reasonable rates today! A common question asked by parents, student, faculty and staff is “how do college students spend their time?” Because a lot of them do not seem to be spending all the time needed in classrooms or on their school work. Heading off to college is one of the most exciting experiences in a young person’s life. The idea of furthering their education, gaining independence and making new friends all make college life appealing. Naturally, there is some stress and anxiety involved as well. Students wonder how they will manage the course workload and how they will support themselves financially. Whether you are a future student or a parent, you may be interested to know how many hours college students study per week – is study really as all-encompassing as you think? Read on to find out more. Of course the focus of college is gain a quality education that will set students up for a successful future. Classes, focus groups, exams and assignments all play a significant part in the educational experience, so it may surprise you to discover that this isn’t where most students spend most of their time. A study by the Bureau of Labour Statistics found that in a 24-hour period, students only spent 3.5 hours on educational-related activities (1). It is important to note that this figure includes classes as well as extra time spent on assignments, homework and exam preparation. 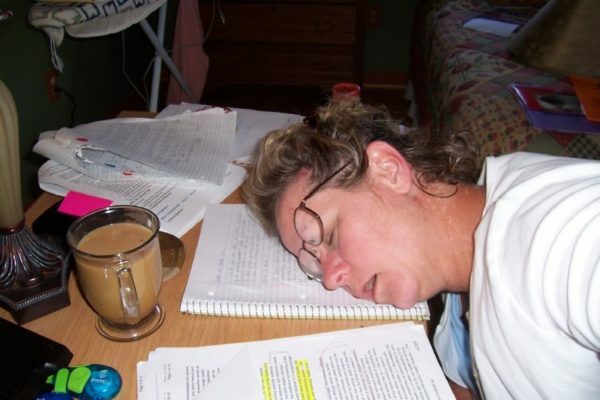 The University of Michigan – Flint recommends that students spend 2-3 hours of study for every credit hour each week (2). So let’s do some math. 1 course = 3 credit hours = 6-9 hours of study each week. Approximately. Full time students undertake 12-18 credit hours each semester, therefore the expectation of time spent on extra homework and study is anywhere between 24 and 54 hours each week. Seems like a lot. And remember, this is recommended homework and study time, you have to factor in the actual 12-18 hours that students spend in the classroom. This brings the weekly total to somewhere between 36 and 72 hours! The Bureau of Labour Statistics released their findings based on a 24-hour period, so if we alter the guidelines from a weekly figure to a daily one, it is recommended that students spend 5.14 – 10.29 hours on education activities each day. These results make it a fair assumption that students are not as time-laden with their educational responsibilities as they make out to be. So where do college students spend the majority of their time? And can they find more time to focus on their studies. Keep reading. How Long Should I Study – Where is Time Spent? It will come as no surprise that the majority of time in a 24-hour period is spent sleeping, around 8.8 hours. Sleep is important so it is probably worth leaving that time as it is. So are there other areas that students could decrease the time spent in order to optimize their study time? The chart below highlights the results from the BLS Time Use Survey, showing that the other two sizeable chunks of time are spent on sport and leisure, and work related activities. The former probably comes as no surprise, after all, isn’t college also about having fun? The work factor adds a great discussion point. Many students need to work to support themselves financially, even full time students, so quite often it will take priority. To ask students to cut their work hours may not always be possible. Likewise sport commitments may also be difficult to decrease. Sure, it is probably safe to say that time spent watching television could be less, but realistically, with only 24 hours in a day, there is only so much a college student can get done. How Much Time Do College Students Spend on Social Media? This same study concluded that women use their phone a hugely time consuming ten hours each day!! Their male counterparts spend almost eight hours. This is a lot of time. Of course people need to use phones to maintain communication lines and relationships, and emails may often be school-related, but it certainly gives some good for thought when it comes to effective time management. Naturally some subjects are more time consuming than others. Equally, there may also be a difference between first year students and seniors. Results from the National Survey of Student Engagement shows that various course majors spend different amounts of time on extra homework and study. The table below compares various courses and how much time students spend preparing for class. A large proportion of engineering students spend more than 20 hours each week, while most business or finance students fail to hit the 20 hour mark (4). The differences in course material and faculty expectations could account for these differences, but it shows that regardless of the course, students don’t seem to be doing enough outside the classroom to gain the academic results that they are truly capable of. 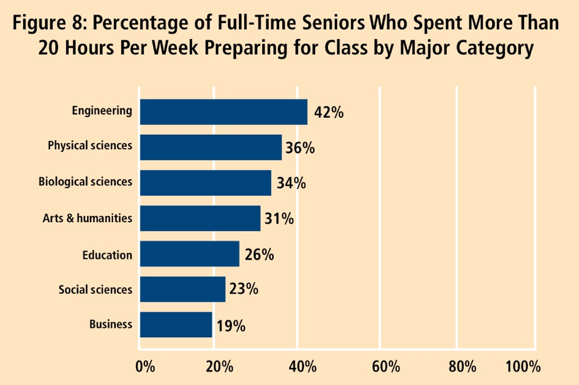 Based on the results of the time use survey and how many study hours are recommended, it will come as no surprise that 22% of engineer majors who spend more than 20 hours each week preparing for class, still feel unprepared (4). There is the common thought that college students spend countless hours in a day hanging out at parties and spend far too much time hanging out with their friends instead of focusing on the fact that they have come to college to gain an educational qualification. A study by UCLA shows that this is, in fact, not necessarily the case. 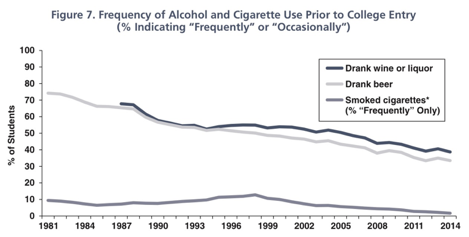 The amount of time freshman students spend socializing and drinking have both declined over recent years (5). But, how much time do college students spend on social media? Students clearly aren’t spending their newfound time on studying, so perhaps phones and social media have a lot to answer for? Whichever way you look at it, college students are not spending as much time on their actual education as they could or should be spending, that much is clear. However, with the large gap between what is recommended and what students are doing in reality, one has to wonder if the educational expectations are too high. Equally, college students are still graduating successfully, so they must be doing something right. Socializing and drinking have decreased, but the use of mobile phones and social media is on the rise and soaring. Students still work to support themselves and there will always be time spent on sleeping, eating, “life stuff” and travel. Overall, students are attending college in an ever-changing world – one where internet use is becoming more and more essential, and social networking may have just as much of an impact on future employment as do their educational results. There should always be more time spent for educational activities, but perhaps it is just not as essential as once thought. And that’s our review of how college students spend their time!